The principal site of the Holocaust in Belgrade and one of the (almost) "forgotten camps". A little more commemoration revolves around the camp's additional function as an internment site for Serbian political prisoners and partisans. Currently totally underdeveloped, there are calls for turning the site into a proper memorial centre. We'll see. More background info: Sajmiste was a former trade fair / exhibition ground set up in 1937. At the time of the occupation of parts of the Balkans by Axis powers during WWII the complex lay mainly unused and derelict. So the Germans turned it into a concentration camp. Due to the occupying powers having split up the former kingdom of Yugoslavia, the Sajmiste site on the western banks of the Sava fell into Croatian territory. But the Ustasha, the Croatian fascists allied with Nazi Germany (or rather: used as a puppet regime serving the latter), granted the Germans the use of the site as a concentration camp. To this day this is grounds for animosity towards Croatia on the part of nationalist Serbs. Some were executed in Jajinci (the men mainly), like those victims from the Banjica camp in the south of Belgrade. But in order to complete and "smoothen out" the "operation", a gas van soon came into use. This was the same type as developed and first used at the Chelmno death camp in Poland. Out of Belgrade's ca. 10,000 Jews at the start of WWII, at least 7000 were murdered in this way at Sajmiste, in particular women, children and the elderly. The gassing took place en route to the same mass grave site at Jajinci as that for the victims executed there before. By the spring of 1942, the "job" had been done, i.e. the extermination of the Belgrade Jews completed. Only a few dozen are believed to have survived. From then onwards, the function of the Sajmiste camp, also called Semlin (after the German name for the nearby town of Zemun), changed to that of a detention centre for captured partisans, political prisoners and so forth. And for them the fate was forced labour rather than immediate extermination. In total at least 30,000 inmates (some sources put the figure as high as 100,000) went through Sajmiste between spring 1942 and the time of the camp's closure in September 1944. Before that it was hit once by allied bombing, in which some 80-200 inmates were killed and more wounded. However, far more died in the camp from diseases and malnutrition. Many more didn't survive the forced labour they were sent to do in other parts of the German occupied territories (such as Norway). During the last few months of the use of the camp at Sajmiste, more Jews became victims, this time the remaining Jews from Kosovo and Hungary, who were sent on to other camps (first still to Poland, then e.g. Bergen-Belsen), even shortly before the liberation of Belgrade in October 1944. After the war, the site was long neglected, but when some form of commemoration arrived, it only honoured the resistance fighters against fascism – in the usual fashion seen all over the socialist world (cf. e.g. Sachsenhausen or Münchner Platz). The fate of the Jews as the first and prime group of victims was not especially pointed out. The memorial stones put here in 1974 and 1984 (the current one) just collectively mentioned "40,000" victims from Serbia tortured and murdered here. Even after the fall of communism all over Eastern Europe, the site remained more one of remembrance of the Serbs' suffering at the hands of the Croatian Ustasha (rather than a Holocaust memorial site). When the main such remembrance site, Jasenovac, fell to the newly independent Croatia during the Balkan wars of the 1990s, the Sajmiste site took over that role. In 1995 a grand new monument was set up by the Sava river promenade to serve as the new focal point for such remembrance. What there is to see: Not all that much, at least at the moment. The main memorial sculpture from 1995 is the most visible component at the site, and the most prominently located one – right on the Sava river promenade. But even this monument is completely unmarked, giving no hint as to its meaning. Only wreathes left at the foot of the memorial may be an indication (but necessarily a selective one). Otherwise, if you don't know what it's for you'd hardly ever guess what this monument is supposed to commemorate, given how abstract it is. Further into the site, there's a much smaller memorial stone by the road with a five line inscription which, if you can read Serbian, at least gives a minimum of information about the significance of the site ... and even if you can't read Serbian, the words "Gestapo", "Ljudi" and the figures 40,000 and the year 1941 provide clues. The main original building still standing is the central tower – the top of which you can already see from afar (good for orientation!). It's a very distinctive structure with a kind of concrete mast sitting on top of a circular three-storey building. The rooms inside are currently in use as artists' studios and inaccessible to the public. You can only view it from the outside … and it does feel a bit like you're intruding on private property, with lines of laundry and playground swings etc. on the lawn. So try to be discrete when visiting the place. 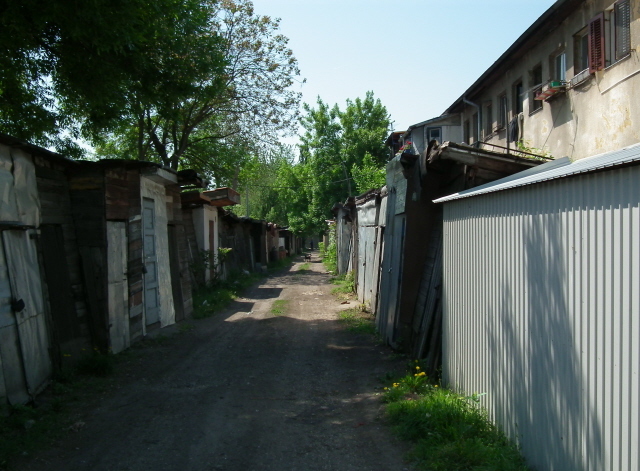 Some of the surrounding buildings are also leftovers from the original camp, but again, out of bounds to visiting tourists inside, in some cases even the grounds cannot be accessed freely. Some are residential buildings, others now house businesses – with car-related enterprises particularly dominant (the former German Pavilion, for instance), including car sales showrooms and repair shops. At the time I visited (in late April 2011), I found the site hardly commodified as a memorial at all – save for the sculpture by the river and the small memorial stone. Whether any of the suggestions to set up a proper memorial centre at the site will come to fruition remains to be seen. For the time being, it's probably more for the really dedicated dark explorers, but as such definitely worth the little detour when in Belgrade. Location: in the small area of the former "Staro Sajmiste" ('old trade fair ground') on the western bank of the Sava river, between the eastern end of New Belgrade and the river, about a mile (1.6 km) from the city centre. Access and costs: fairly easy to get to, no access to the inside of buildings, but the outside can be freely viewed. Details: To get to the site from central Belgrade, it's best to first make your way to the main railway/bus station and cross the Sava river on the Stari savski bridge just north of the station. At the western head of the bridge use the stairs leading down to the river promenade and head north to get to the main monument. Alternatively get a tram: line 7, 9, or 11 across the same bridge, though the tram stop is further down from the bridge head. Afterwards proceed inland along the northern side of the sports centre and past the residential buildings to get to the memorial stone on the right hand side of the road. You will already have spotted the distinctive central tower building to the south from here, which you can then circle, before heading back to the south of the complex and the bridge. You can also get a tram back into town from here. You could also use the Brankov most (bridge) to the north (bus line 72 uses it too), and walk south from the stairs down to the river and the monument. Time required: not long, perhaps half an hour in total. Combinations with other dark destinations: in general see Belgrade – not exactly nearby but thematically linked is the museum of Banjica concentration camp in the southern suburb of the same name. The Military Museum in Kalemegdan Fortress also has a section that covers the same grim period in Serbia's history, although without any particular emphasis on the plight of the Jews or other victims of the Sajmiste camp. 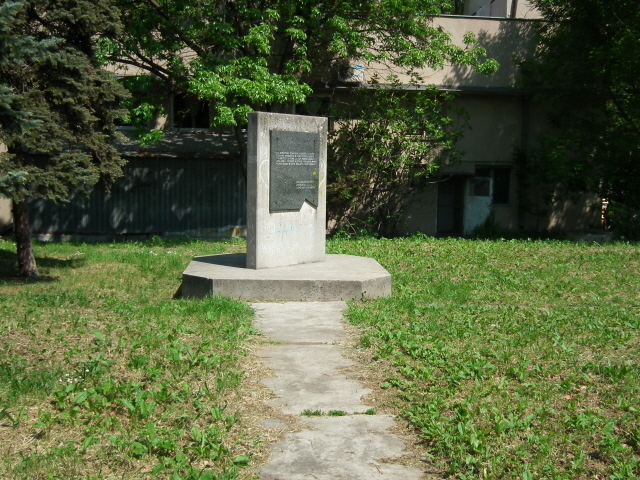 The nearby Jewish Historical Museum in Belgrade also holds materials related to Sejmiste – and it forms part of the campaign to turn the site into a proper memorial centre (as a panel outside by the street documents). Combinations with non-dark destinations: see Belgrade – Sajmiste's location on the left bank of the Sava river, i.e. on the edge of Novi Beograd, does not make for a particularly touristy attraction, except for the views across the river of the old city skyline. Another exception is the Museum of Modern Art, which is located ca. half a mile (800 m) to the north of Sajmiste in the Sava riverside park. It is housed in a strikingly modernist building. The Usce shopping centre is even closer, to the north-west along Bulevar Mihajla Pupina. The floating restaurants and bars/clubs moored along the banks of the Sava are also amongst Belgrade's "hottest" nightlife locations.